The O.S. 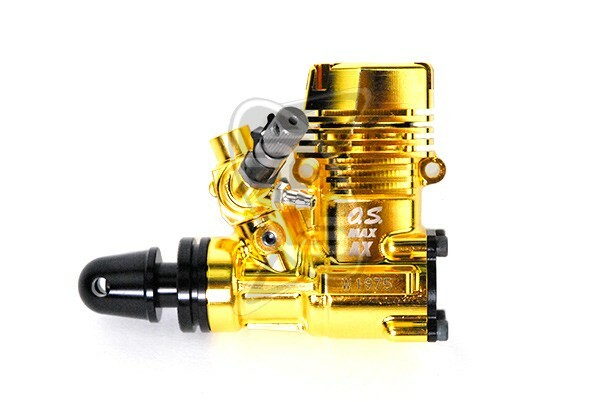 Max-11AX Gold is designed and made in commemoration of O.S. Engines' 80th Anniversary. O.S. Engines in Japan announced a super exclusive series of 80th Anniversary Limited Edition OS MAX-11AX engines. Each GOLD engine are marked with a serial number between W1936 and W2015, so only 80 of each worldwide. Cylinder head, crankcase, carburettor and all the internal parts are fully machined without sacrificing easy start and easy operation. - A beautifully CNC machined crankcase and head. - Matching plating on the carburettor. Output 0.31ps / 0.31hp / 18,000 r.p.m.